Well there was quite a bit of griping at the last knit night about finishing up the Tin Can Knits KAL. It seems that a postponement is in order so the party and show off date has been moved to April 5th.What do you need to do to join in the fun? Just choose a pattern from the myriad of Tin Can Knits patterns, cast on, finish by April 5th, and come to knit night to show off your FO! So now that you have a bit of time, why not try our latest pattern, Stovetop? 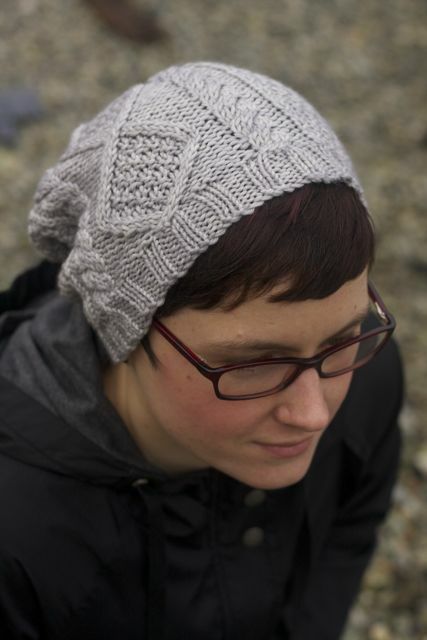 This cabled beauty is sized from baby to adult, so you can knit one for everyone. All you need is a little worsted weight yarn and a pompom maker (ok the pompom is optional but why not?!). It would look beautiful in anything from Cascade to SweetGeorgia, Debbie Bliss Rialto Aran to Madelinetosh Vintage, whatever your heart desires. If you’ve never tried cables before it might be a good time to start. One 1/2 hour private lesson is usually all it takes to have you criss crossing your stitches! The Stovetop pattern will be available at UY next week. This entry was posted on Friday, February 22nd, 2013 at 1:07 am	and is filed under Uncategorized. You can follow any responses to this entry through the RSS 2.0 feed. Both comments and pings are currently closed. Do we have to be at your knit night in person?